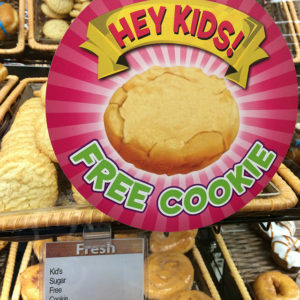 If you give your kid a free cookie in a supermarket, he’ll ask you 100 times for another one. Trust me, I’ve tried it. Hello! I recently wrote a post with an example of a kids’ book that uses first conditional. That book is The Runaway Bunny, and you can read the post (including a video of a person reading the book) here. Today I wanted to share two more books that have excellent examples of the first conditional in English. I just noticed them a few nights ago, even though I’ve been reading the books to my kids for years now. The books are If You Give a Moose a Muffin and If You Give a Mouse a Cookie. You can watch the videos below. Many different people have uploaded different videos of them reading the books, but I like these two versions because the text is visible (and you can also turn on subtitles). As you can probably notice, the books are very similar and a bit repetitive. But that’s fine, since they’re books for kids. And believe me, they work. Kids love them. However, I think they’re also great ways to help you learn more about English and English grammar. Even if you’re a full-grown adult, you can still practice your English skills by reading these books. If you can’t remember how the first conditional works, check out this article that I wrote that explains how and when to use it. To summarize, you use the first conditional when you’re talking about real, possible situations that might actually happen. There are generally two parts: the condition and the result. The condition is in the present simple tense, and the result is in the future simple tense, usually with “will.” There are always exceptions in English, but that’s the general rule. If you give a moose a muffin, he’ll want some jam to go with it. When he opens the door and feels how chilly it is, he’ll ask to borrow a sweater. When the scenery is finished, he’ll get behind the couch. Those are just three examples, but the books are completely in first conditional, really. When he sees the sheet, he’ll remember he wants to be a ghost for Halloween. He’ll try it on and shout, “BOO!” It’ll scare his so much, he’ll knock over the paints. In that example, the condition (when he sees the sheet) leads to four separate results. That kind of mixing and matching is really typical in English. Finally, notice that many of the conditions don’t necessarily start with the word “If.” Many conditions do start with “If,” of course, but they can also start with other words or phrases like “When,” “As soon as,” “Before,” “After,” and others. I hope you have a chance to check out these books. Let me know what you think of them. And if you can think of other books or songs that use the first conditional (or any other English skills), then please let me know in the comments–I’d love to hear from you!